Hollybeary Creations : NND February Release Day 4!! NND February Release Day 4!! It's day four of the Newton's Nook February Release and all the new products will be available in the store tomorrow. 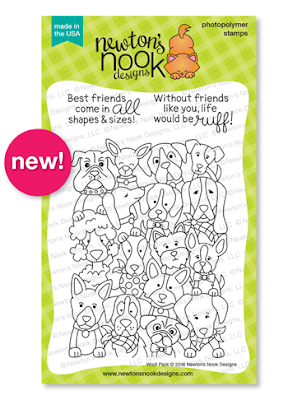 Today we are introducing Woof Pack!! I stamped the image onto some white cardstock and then I die cut the panel with the Frames and Flags Die set. Then I adhred the frame to a Kraft Card base. I stamped the image a second time onto some Watercolor paper and used the Banner in the Frames and Flags die set to die cut a section of the image. I colored the image in with Distress Inks and an Aqua Brush. Was it was dry I adhered it over the origianl image with some foam tape. Creating a spotlighted area. Then I added some twine along the top. I die cut another banner and added some of the same Salty Ocean Distress Ink and stamped the sentiment when it was dry. I adhered it along the other edge going the opposite direction. There are so many fun techniques you can do with this set!! Would you like to win the “Wolf Pack” Stamp Set? 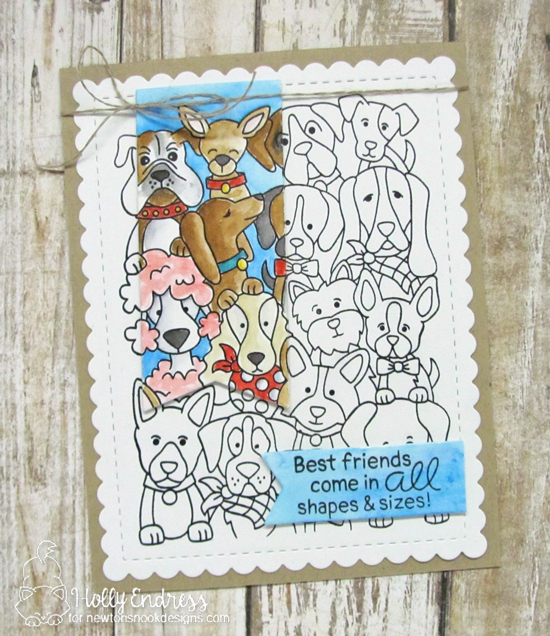 This dog stamp is SO versatile! Awww!!! Love your adorable and funny card!!! I really like this card! I like how just the tag is colored! Adorable card! Love the way you colored just the banner shaped section! Cute design with the coloring on the banner. Cute card! I love the pink poodle! I love those doggies, such a great variety! Love the spotlighting with a tag shape, pretty original! Very cute card! That’s a great card ! I love the highlighted part ! Wonderful card! I love the banner piece of coloured dogs - great design! So cute! Love the spotlight banner and the "just stamped" background. Wonderful spotlight - the flag shape is new and different take and fits perfectly on this card. Very cool use of a banner. Love this!! I love how you spotlighted just part of the image with color on the banner! So fun! Wow using that tag is really a clever idea! Fun idea for this stamp set. Love it!